Dear Class, You have provided me with much joy with your finger turkeys. Here are my thoughts on some of them. I like the color choice on this turkey. It creates a festive and inviting atmosphere. The addition of the wing on the side is nice touch. A more abstract representation is achieved through the use of the color red. Do they really say gobble gobble? A more basic finger turkey. The math bleeding through from the opposite side of this paper creates an interesting effect. One of few turkeys wearing a pilgrim hat. It made me curious as to the cultural origins of why finger turkeys are drawn to be wearing one. A pretty basic finger turkey. The use of crude pencil shading is interesting. Not many students did this. The one of only two finger turkeys with realistic feathers. Ironically, also has realistic finger nails. Creates a grotesque effect. A minimalist approach. Surface details are eschewed to create an iconic effect. A blank space represents the sadness left behind when a turkey leaves this world. 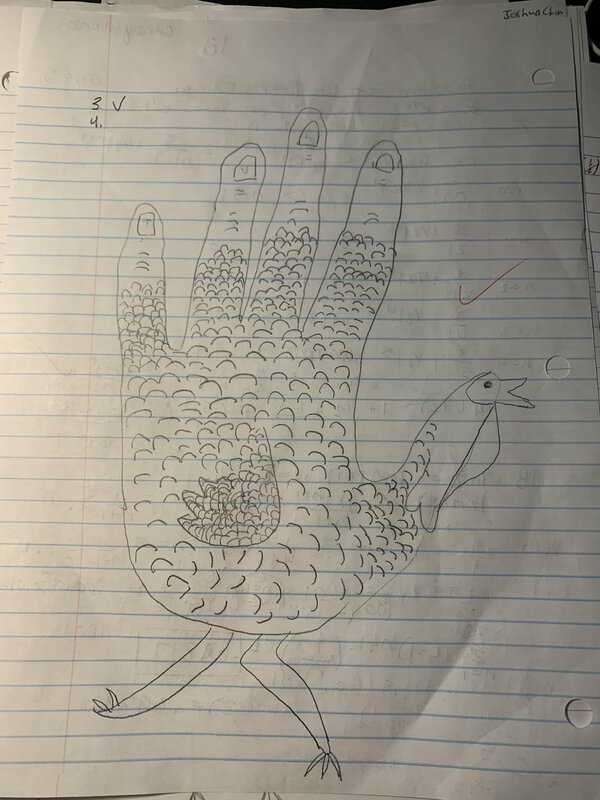 Not a finger turkey, because the artist did not actually trace his/her hand. A rebellious approach. One of the more realistic looking turkeys. It looks really fat. A third in a serious of fake finger turkeys. This one is also wearing a pilgrim hat. The artist used different shading patterns in each finger, creating a ruffled look to the feathers. Another one of the few turkeys wearing pilgrim hats. 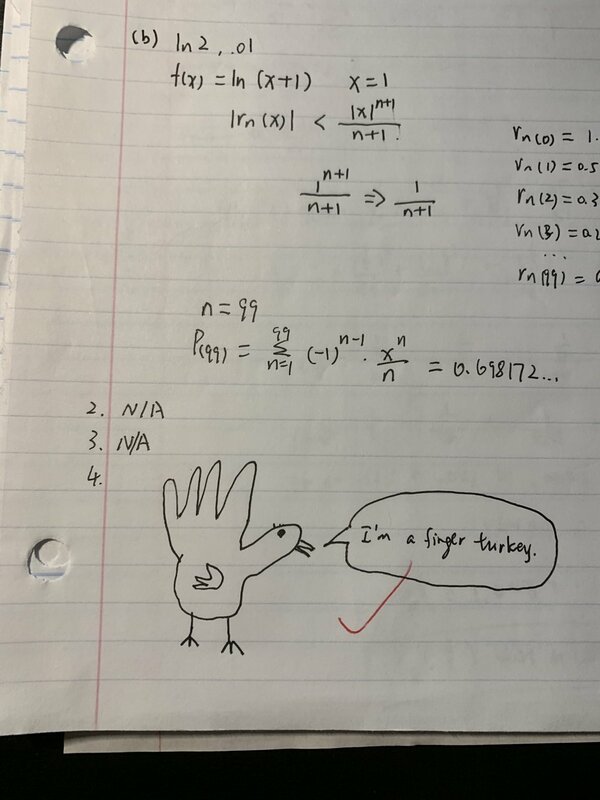 First in a series of math-themed turkeys. This one has math symbols tattooed on it. For some reason. The choice to outline, rather than fill-in, the turkey with color was highly effective here. I really love the colors here. 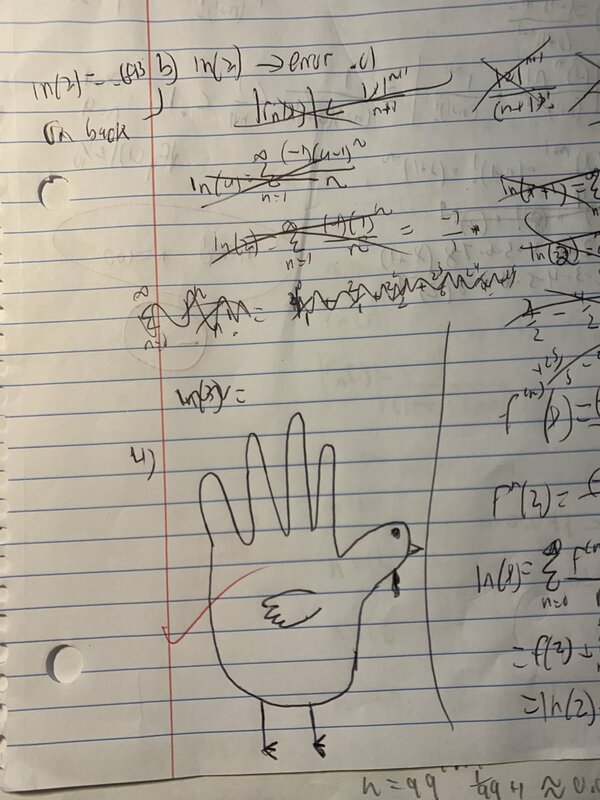 A second in a series of math-themed turkeys. Except what it’s saying doesn’t make any sense. Turkeys wouldn’t know logic. 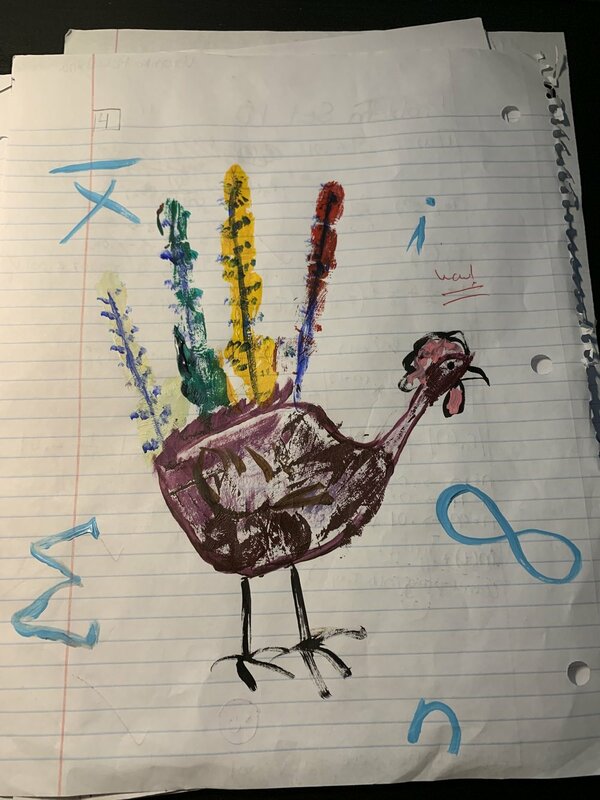 A third in a series of math turkeys. But why Euler?